Weak WiFi signal in parts of your home? A WiFi range extender might be what you need. We’ve tested 7 models. Snapshot: The D-Link DAP-1520 (AC750) is a dual-band WiFi range extender that has a WPS button for easy protected setup and a signal strength indicator. How did it perform? Snapshot: The Netgear EX6150 (AC1200) is a dual-band WiFi range extender that has a WPS button for easy protected setup and a signal strength indicator. How did it perform? Snapshot: The Belkin F9K1122au (N600) is a dual-band WiFi range extender that has a WPS button for easy protected setup, but no signal strength indicator. How did it perform? Snapshot: The TP Link RE200 (AC750) is a dual-band WiFi range extender that has a WPS button for easy protected setup and a signal strength indicator. How did it perform? Snapshot: The Asus RP-N53 (N600) is a dual-band WiFi range extender that has a WPS button for easy protected setup and a signal strength indicator. How did it perform? Snapshot: The TP Link TL-A850RE (N300) is a WiFi range extender that has a WPS button for easy protected setup and a signal strength indicator. How did it perform? WiFi range extenders boost your router’s wireless signal, which allows your home WiFi network to reach further. Typically, there are three types of range extender: the standalone, which looks similar to a router and needs to be near a power socket for power; the wall plug, which plugs into a power socket and looks like a powered air freshener; and USB, which plugs into a computer. Which you should buy depends on your home’s layout and where you are putting the range extender. All range extenders in our test are wall plug models. Unsure if you need a range extender? You can check by moving your wireless router to the most central location in your home and testing its range by monitoring a mobile device’s signal strength while you move away from the router. If the most central place in your home isn’t near your phone jack and modem, then use ethernet cables to get the router as centrally positioned as possible. 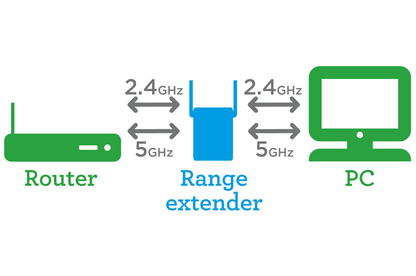 A range extender sends and receives pieces of data (called “packets”) between the router and devices. These communications are performed using radio frequency bands. Most routers are simultaneous dual-band, using the 2.4 and 5GHz bands. This means you can set-up two separate networks, one on the 2.4GHz frequency, and another on the 5GHz frequency. Some routers are even tri-band, meaning they have a 2.4GHz network and 2 5GHz networks. However, some WiFi range extenders aren’t dual or tri-band, meaning they can only communicate with your devices and the router using either 2.4GHz or 5GHz. This can result in a noticeable drop in speeds and performance as the one band available is used for all traffic, effectively causing a traffic jam. Dual-band and tri-band are useful if you have other devices that operate on one of these frequencies that could cause interference, such as a cordless phone or a microwave, both of which use 2.4GHz. It also means you can split different types of traffic on to each frequency to increase the speed and reliability of each network. For example, you could set your printer on the 2.4GHz band while simultaneously streaming video on 5GHz. To test speeds, we place a range extender 10 metres from a router and then place a laptop 2.5 metres away from the range extender. We then transfer files from the range extender to the laptop on the 2.4GHz and 5GHz bands. As a point of reference, we then place the test laptop at the same spot where the range extenders were plugged in (10 metres from the router) and recorded the speeds. The loss in throughput speeds is the percentage difference compared to this reference speed. There is always a drop in speed when using a range extender as there is an additional step that the signal has to go through. This affects how quickly data can be transferred over the network. The larger the drop, the slower the network will be. For example, for one of the range extenders we tested, the signal was 36% slower on the 5GHz band and 24% slower on the 2.4GHz band compared to when the laptop was plugged into the router directly. Walls and furniture can weaken the signal from range extenders and routers alike. While most modern internal walls aren’t too much of a hindrance, brick and extra-thick walls can reduce signal strength. You can try to combat this by placing your range extender next to a window or even up near the ceiling where there are fewer obstructions. Alternatively, you can use ethernet cables for part of your home network. These have little to no loss of throughput speeds. The only way to achieve close to ethernet cable speeds on a WiFi network is to use a dual-, tri- or quad-band router along with a dual-band range extender. It’s possible to daisy-chain range extenders together, but the more additional steps there are in your network, the more speed you’ll lose. If a single range extender won’t expand your network as far as you need, consider making part of your network wired. For example, have an ethernet cable between the router and the range extender. Should I just buy a new router? Router technology has improved dramatically in the past 5 years, and now tri- and quad-band routers are becoming common. 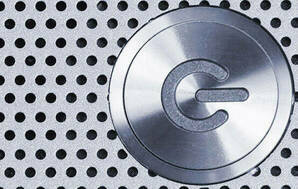 You may find a new router is powerful enough to cover your home without having to use a range extender. Smart switching is where a router with two 5GHz networks distributes the workload over both networks at the same time. This means if one 5GHz network is too busy or overloaded, then the router will transmit over the other network, letting it pick up the slack.